If other businesses are benefiting from new tech offerings, why shouldn't us #eventprofs get a slice of that pie? We all fear that same event nightmare: You're putting on an event in a couple of hours. You've set up the presentations for the first stream of the event with the second stream ready in the other room. Everything is on track until you get that WhatsApp message from a team member who would be manning the registration desk and cloakroom saying they can't make it in time. To make matters worse, your guests are arriving within hours! No matter how big or small your events team is, many would struggle to resolve headcount issues in those critical moments. Aside from turning to your best friend or family for help, there's actually a hassle-free way to hire temporary staff quickly. Buzzhire boasts a 3-hour notice time on their website, having realised a 30-minute average confirmation time for 400+ venues in London so far. Their app also has geo-tracking, which means you will be able to predict late arrivals before they even happen. At the time of writing, Buzzhire offers temporary drivers, baristas, kitchen porters and waiters. They have worked with many caterers and venues, such as Kai Catering, Finchley Golf Club and Union Bar. As you know in events, time is actually money. Here at Hire Space, we started using Slack internally, then rolled it out to our key suppliers. It significantly reduced the number of emails we send, quickened feedback from colleagues and suppliers, and was fun and easy to use. 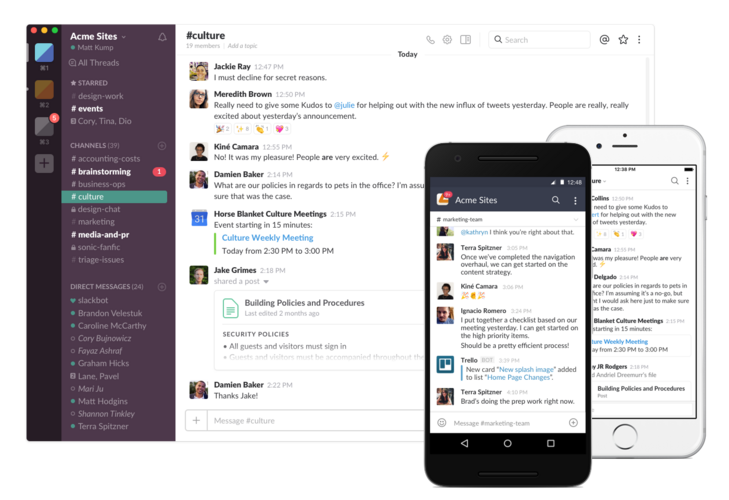 Slack works in 3 modes: private messages, public channels and private channels. Slack channels, which are akin to Whatsapp groups, are especially useful for staff who are out and about to stay in the loop of discussions in their teams and projects. To our surprise, many eventprofs also use Slack with their teams and even event attendees! It's a smart and much cheaper software when compared to premium event apps on the market. Some choose to invite delegates upon sign-up to join Slack. Not only is it a great way to distribute useful information like where the venue is, closest stations, agenda updates, it also gives delegates a feel of the buzz before the event. You could even start an online debate and resolve it at the venue! You might observe a significant decline in last-minute customer service emails, too. Set channels called 'Information Desk' and 'Meeting Appointments'. This invites attendees to engage with you before the event. Tweak your Slack's look & feel to your brand standards. Pre-populate channels with topics and invite speakers and judges to interact with attendees. Moderate these channels regularly. Engage delegates by posting announcements such as the locations of coffee stations and live polling. Although not as widely used in events as Buzzhire and Slack, we imagine Estimote beacons could be perfect for event marketers. These beacons are light and connect via HDMI, making them compatible with standard screen ports and AV towers in different venues. What sets Estimote apart is not what it does, but what it allows others to do, purposefully and otherwise! Here's a simple example: You're hosting a product launch for your latest apparel designs and you've invited key marketers and industry buyers. You pre-program the beacon to display unique promotional videos for each design when triggered. You put an Estimote sticker on each product on display. When someone picks up or touches one of your products, the screen in front of them will display the video for that specific product. This is just a tiny bit of what Estimote does. This video below shows how different objects are triggered by people's actions. Event professionals have always paved the way for creative applications of new technology. What will be our next new find?